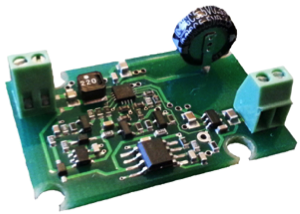 The KM3 converter is a Maximum Power Point Tracking (MPPT) converter for thermoelectric power generating arrays (TEGs). 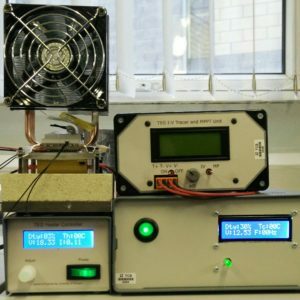 It operates the TEGs at their optimal operating point and efficiently transfers electricity to the necessary output battery (not included). 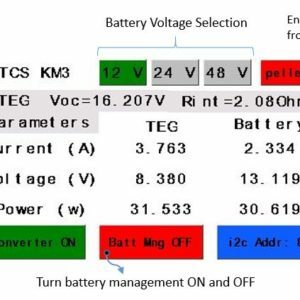 Battery charging management can be activated to improve the state of charge of the output battery. The KM3 converter interfaces TEGs whose voltage can be either lower or higher than that of the output battery. 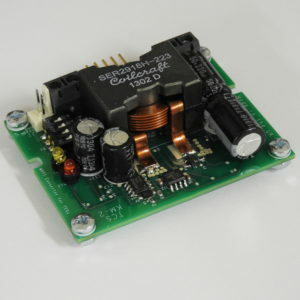 It starts its voltage step-up operation with input voltages as low as 2V and continues harvesting electrical power provided that the TEG open-circuit voltage does not exceed 85V. The optional touch-screen displays shows instantaneous input/output voltage, current and power. 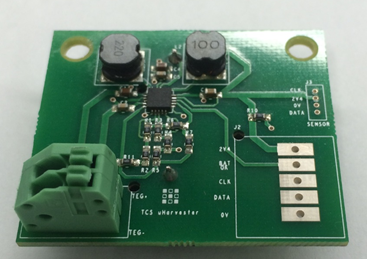 It also allows to turn on/off the converter, the battery management, and to select a different I2C address.